As we announced last week, Season 2 will begin on July 1! As we count down to that exciting date, I want to go over some changes to how Living World content will operate in future seasons. 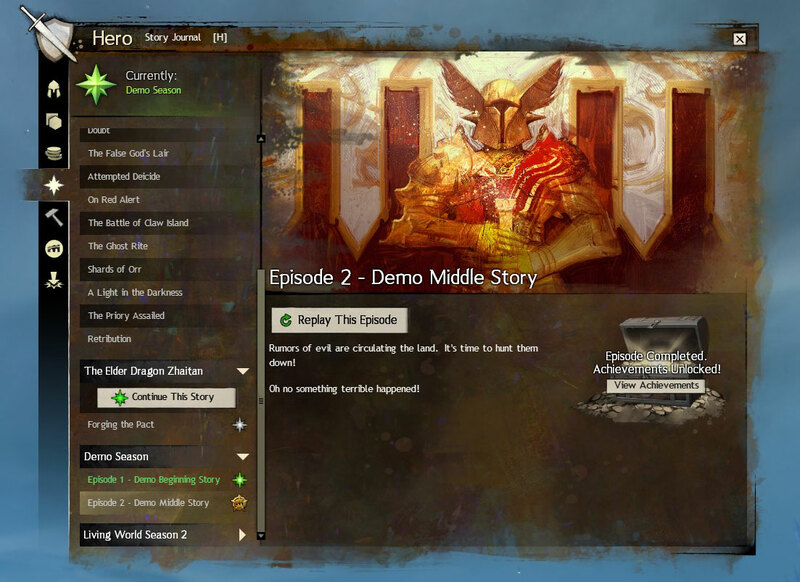 Starting with Season 2, each new episode of Living World will use the same UI as your personal story. A green star will mark locations, and a green story UI in the top-right side of your screen will summarize the current step your character is on. The gold star UI we previously used for Living World will only be used for holiday festivals in the future. When your character is actively on a Living World story step, you will have one single green star leading you to the next step in the world and the top-right UI will reflect that step, just like you experienced in your personal story from levels 1-80. 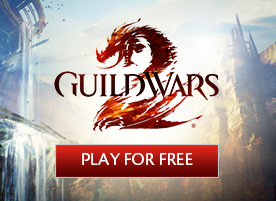 Chronologically, the Season 2 story will take place after Season 1, which in turn occurs after your character’s personal story and the story of Zhaitan in Guild Wars 2. For dialogue purposes, NPCs in Season 2 will assume your character completed their personal story and Season 1, even if they did not. You do not need to complete the personal story on a character in order to play the Living World content, although it will make more sense if you do! To go along with this change, we’re modifying the story Journal in your character’s Hero Panel so it will track all of your character’s story steps. From that panel, characters who are level 80 will be able to select between playing their personal story and the Living World story. 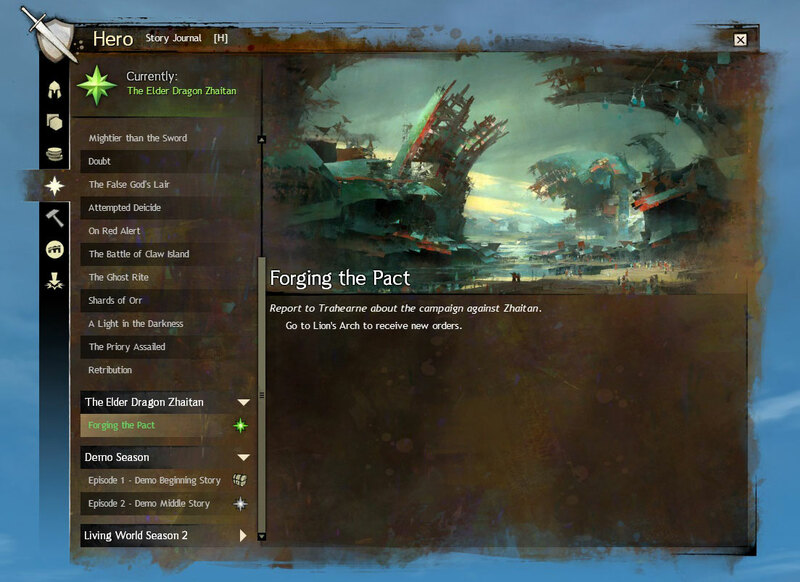 For the Living World story, you’ll be able to select which unlocked episode you’d like to play. Characters under level 80 will be able to see the available episodes, but will not be able to play them until they reach level 80. Think of the Living World story as the constantly expanding continuation of your character’s storyline once they reach level 80. To unlock an episode and have it added to your Story Journal, you simply need to log into a map with any of your characters during the two-week period that the release is live to be given permanent, free access to the storyline of that episode. Once you’ve unlocked it by simply logging in, you can replay that episode’s storyline on any character on your account as many times as you like from your story Journal forever. Past episodes will be available for purchase for 200 gems. (Don’t forget you can earn gold and purchase gems to unlock the episode for your account). With this addition to the story Journal, content from Living World episodes will be a mix of new story steps and open world content. Story steps will work just like existing story steps in the game today by taking you on a journey specific to your selected episode, which ties into a broader narrative from the season’s continual story progress. Open world content additions to Living World updates will permanently expand or change the world of Tyria and will tie to the theme and story of the episode. This means you can play the open world content and the story content (if you’ve unlocked that episode) anytime you want, on every character you ever make on your account! You’re no longer limited to completing the episode during its two-week release window. This means that going forward, all of the content and all of the rewards for Living World will be permanent. Because story steps for your personal story contain choices that permanently alter your character, we will not be allowing the replay-story-step functionality for the existing personal story at this time. Also, because Season 1 of Living World was not built with the Journal in mind, it will not be available in the story Journal on initial launch when Season 2 begins. We do hope to add Season 1 to the Journal in the future. As I mentioned earlier, only festivals will continue to use the gold star UI. They will not be in the story Journal, and they will remain as temporary content that comes in each year for a period of time and then packs up and leaves when the festival has completed. In Season 2, we will be moving away from the concept of meta-achievements entirely and modifying how we handle rewards and achievements for Living World content. Completing the storyline of an episode will grant you a reward at the end of the episode, and a variety of new rewards will be available through the open world content added via each of the episodes. Achievements within story steps from episodes will operate very differently as well. 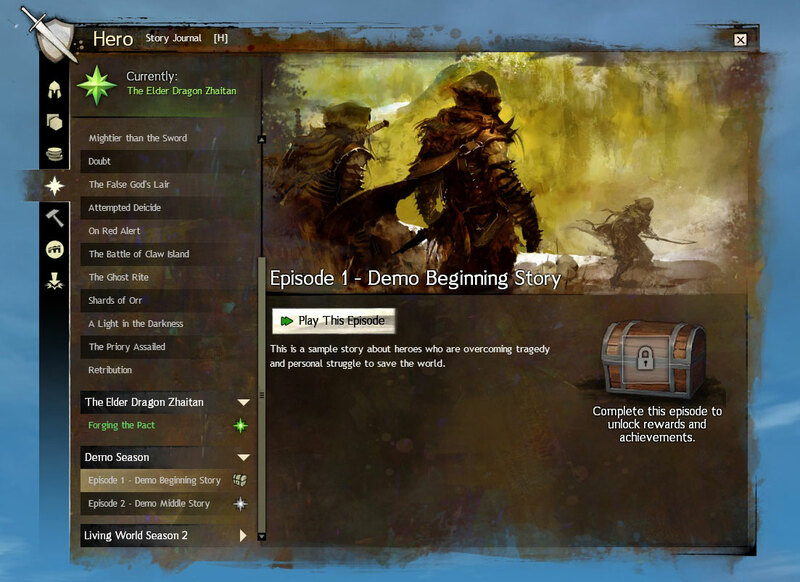 Once one character on your account has completed an episode in their story journal, every character on your account will have access to a set of challenging achievements. 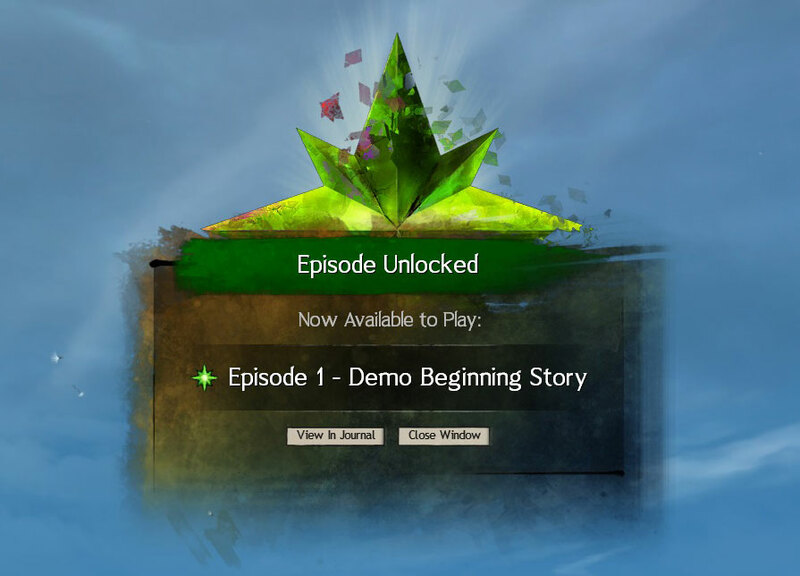 At any time once unlocked, you can return and attempt to replay that episode in order to complete the achievements. The achievements will be much more difficult to complete than those traditionally found in Season 1, and are intended to be challenging achievements for skilled players to overcome. 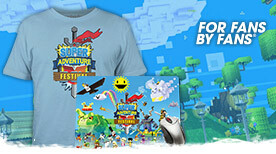 Each achievement will award both achievement points and material rewards. That covers all the changes we’ll be making to the structure for Season 2 of Living World. We’ll see you on July 1 for the kickoff! 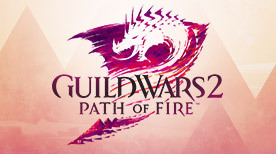 Don’t forget to catch the Festival of the Four Winds, going on in-game right now! This festival is not only a celebration of our release in China, but it also has a few tidbits hidden in it that help set up Season 2. I’d suggest you pop in and catch up with Rox, Braham, Marjory, Kasmeer, Taimi, and the rest of the gang at the festival before Season 2 roars into full action.